Port Townsend, today. Tacheeda, Bullmoose, Quintette. Sounds like a law firm, or perhaps a micro-brew beer. So what are these people doing, climbing around on a rough-hewn rock face? “This was a weeklong excursion on two RDC’s (maybe 100 people) from North Vancouver to Ft. Nelson and return with two side trips, this one (to Tumbler Ridge) and one to Dawson Creek. My wife took the attached photo from the car of the photo line I was in when I took the picture.” – Marty Bernard. It is a photo line up, with Marty Bernard in that group, clawing around in the rubble to get this shot that appeared in Railpictures.net. This photo got me started on this project! This photo evoked memories of the Tumbler’s awesome electric locomotives, reviving memories of my encounters as a young man with the magnificent Milwaukee Road electrics moaning south out of Black River Junction. 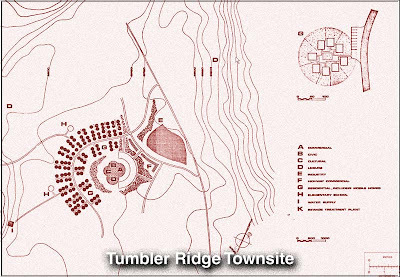 Tumbler Ridge Subdivision was built for a single purpose only, not to develop tourism in the fantastic beauty of the Canadian Rockies, but to move black gold – coal - to the hungry steel plants in Japan. And she is in the wilderness, in the middle of nowhere; my kind of railroad! It is a story I want to share with you. A team of paleontologists uncovered 75 million-year-old bones that may well indicate a Tyrannosaur had a duckbilled Hadrosaur for dinner, near the town we now know as Tumbler Ridge, B.C. These creatures from a “lost world” and the immense areas of vegetation that sustained them are responsible for the vast deposits of coal, both thermal for generating heat of electricity and metallurgical – coke - for steel making. Decades of exploration in the Peace River and Canadian Rockies have uncovered vast deposits of coal. But there is an enormous gap between identifying a marketable resource and having a market for that resource. 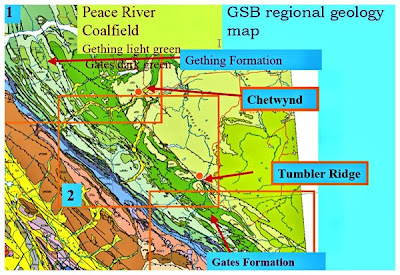 Among the various scenarios for exploitation of these vast coal reserves, Kilborn Engineering published a feasibility study in 1975, for extraction of coal from what would later become the Tumbler Ridge Quintette Mine. As you read it, not only is the coal deposit identified, but also the steps required to get that coal to market are detailed. 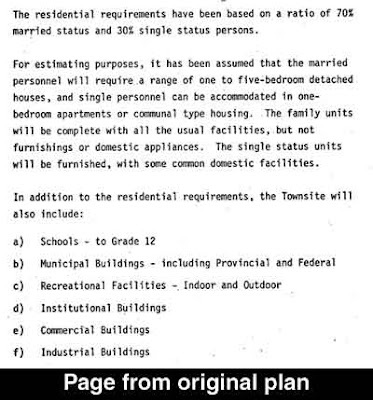 Plans for development of a mine and its supporting town site, right down to the layout of the business and residential districts, including the suggested location of the local Royal Canadian Mounted Police outpost! To get the coal to potential markets, the study called for the construction of a railroad from Chetwynd, on BC Rail, formerly Pacific Great Eastern, some 93 miles to the proposed town site of Tumbler Ridge. 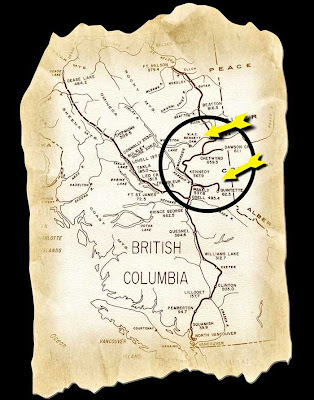 Coal would then be moved south via BC Rail to Canadian National interchange in Prince George, then westward to the deep water Ridley Island Terminals, 10 miles east of Port of Prince Rupert. That study, and many others, gathered dust, waiting for the moment of opportunity. That moment finally hit when the forces of industry came together on February 10, 1981. Representatives from the Governments of Canada and British Columbia, Denison Mines, Teck Corporation and the Japanese Steel Industry came together signing documents that set in motion a complex coal export plan to meet Japanese needs for coking (metallurgical) coal. Bullmoose and Quintette mines had to be brought into production, with processing plants, haul roads to its railroad loading silo/loop, and a mega conveyor system constructed at Quintette to its railroad loading silo/loop. A brand new 85 mile long electric railroad with four tunnels and eleven bridges, overhead catenary and substation plus two loading loops and an interchange yard between Anzac and Tacheeda, approximately 62 miles north of Prince George on the BC Rail main north-south corridor had to be constructed. A new town had to be constructed to support mine development and railroad construction. Everything a town needs, from a bank, hospital, school and public buildings including an RCMP sub-station, residential housing, and all support services including medical, legal, educational, electrical, water, sewer, telephone, cable television and allied services. To get to the new town site, a 60-mile paved highway had to be constructed from Chetwynd to the new town site. 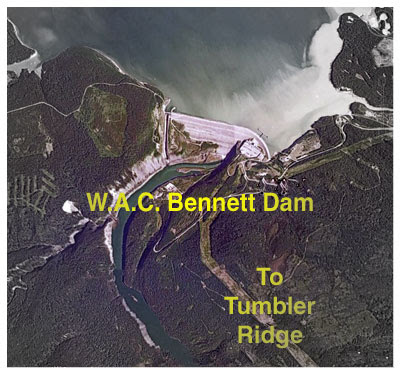 To supply electricity, BC Hydro had to construct a 79-mile transmission line from WAC Bennett Dam to the new town site. Upgrading 467 miles of rail on the Canadian National western extension from Prince George to Prince Rupert was required to handle heavy coal trains. This included the addition of Centralized Traffic Control, lengthening selected sidings, retrofitting brides for heavy coal trains and other mainline considerations. At Ridley Island, some 10 miles east of Prince Rupert, construction of a coal car unloading terminal had to be constructed, including loop for unloading coal cars and processing facilities for loading deep-sea bulk carrier, with an initial design capacity of 12 million tons annually. A fleet of brand new rotary dump heavy duty coal cars needed to be designed and constructed. And last, but certainly not least, a contract was signed in August 1982 with General Motors Canada Limited – Diesel Division (GMDL-DD) to design and prove a new breed of electric locomotive. 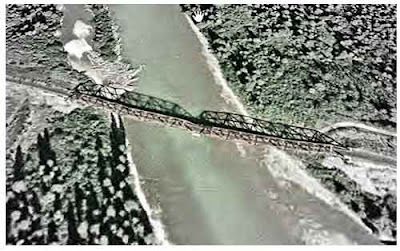 Construction on the town site, known as Tumbler Ridge, was started in 1981. The first building, Royal Bank, opened in 1982. As with any construction – mines, railroad, and town site –a natural phenomenon occurred, as the story goes; single women began showing up in Tumbler Ridge. It was decided that to curb the inevitable, single women had to have a legitimate reason for being in the area. Hence the overnight explosion of licensed “hair dressers,” an ordinance further amended to require “hair dressing parlors” not be allowed in private homes. There were very few women in the community at the time and even fewer completed homes for them to live in. I know that I cant argue the absence of something just because I didn't see it, but I have never found any evidence to confirm their existence, except the stories themselves.” – A Long Time Resident. 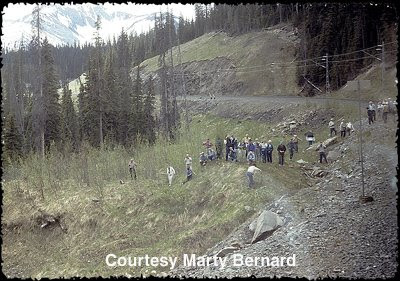 The original rail alignment detailed in the 1975 study north to Chetwynd was abandoned. 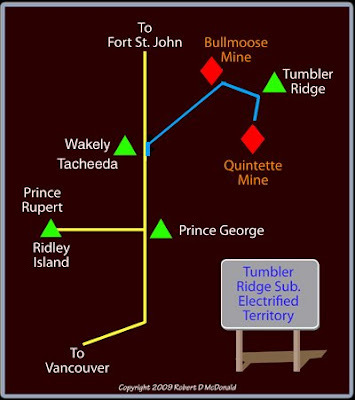 A new alignment was blazed, officially named the Tumbler Sub-division beginning at Tacheeda on the BC Rail north-south mainline, running 84.5 miles roughly east following the desolate Table Valley before reaching its 3, 815 feet summit under the Rocky Mountains crossing the Sukinka river to the new town site of Tumbler Ridge. The alignment, with a ruling grade of just 1.5% empty eastbound, 1.2% loaded westbound, required four tunnels and eleven bridges. 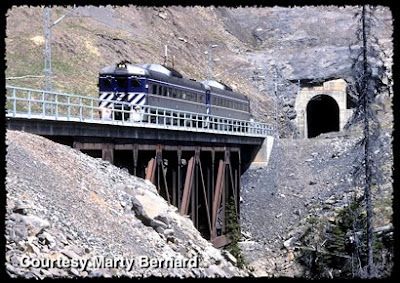 Two tunnels, the 2nd and 4th longest railroad tunnels in Canada, Table Tunnel at 5.6 miles length and Wolverine Tunnel at 3.7 miles length. 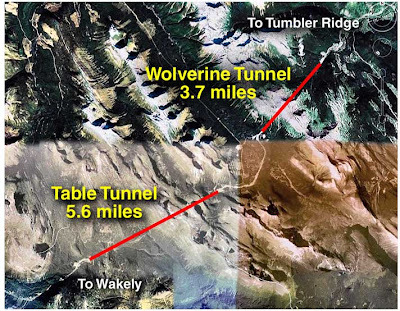 Although loaded trains would be running downhill through the 1.5% Table Tunnel, they would be pulling through the 1.2% Wolverine Tunnel. Faced with the possibility of increasing cost of diesel fuel, expensive tunnel ventilation and purging systems, and an increase in rail traffic, it was quickly observed that the new rail alignment would be within two kilometers of heavy-duty power transmission lines running south from the W.A.C. Bennett Dam. Since the transmission lines were so close, a 50kV 60Hz system was feasible, using a single power station, rather than a series of sub stations, greatly containing construction costs. However, when you “follow the money,” the real impetus came from financial assistance from both the BC Provincial and Canadian Federal governments to build the railroad, provided it used a renewable energy source – electricity. The massive project was finally in motion. 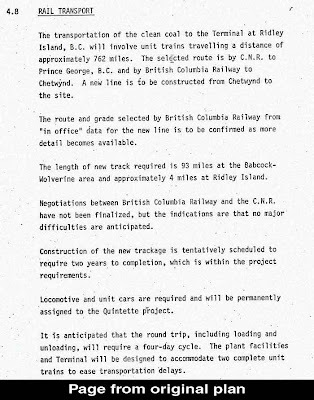 Tacheeda, Bullmoose and Quintette were about to become associated with one of British Columbia’s premier construction projects and the pride of the sitting government in Victoria. The true cost to taxpayers will probably never be known, published accounts placed the price tag to the Province at $1.6 billion, which included BC Rail 85 mile railroad. Development of the two mines added up to another $1.5 billion in private investment. Thanks Robert, great stuff here. I'm looking forward the next installment. I never saw one of the electrics in action, but marveled at them on an old Pentrex video of the Tumbler Ridge. They seemed so smooth and powerful, and all of that coal - amazing stuff. Positive Train Control - Revisited!